Purists know that gumbo is traditionally cooked without rice, and then served poured over rice. 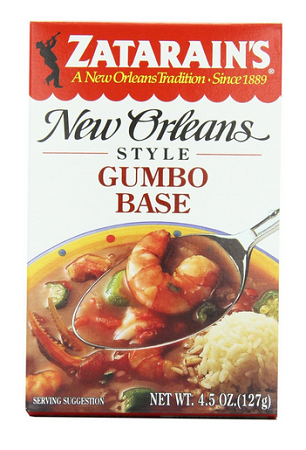 This base prepares nine cups of gumbo by this traditional method. You'll need 1 to 1 1/2 pounds of seafood or meat plus some cooked rice to put in the bottom of the bowl. Tips: Seafood (shrimp, crab, crawfish or oysters) may be used in this dish. 4.5 oz.